Did you have any idea how successful The Lion King would become when you first started to work on the project? TONY BANCROFT: Mark and I were part of the animation team for The Lion King from the very beginning – but when we first started on the movie, nobody had any idea that it would be the phenomenon that it is now. Back then; it was just a small film that we thought would be fun to work on. It was described as Bambi in Africa and we were drawn to the movie because animating animals is always a challenge; there was a lot of excitement and passion put into the movie because of that. How much research did you undertake for the movie? TONY BANCROFT: We did a lot of research for The Lion King. We went on research trips to zoos and we even had real lions brought into the studio so that we could draw them up close and study how they move. We did extensive research on all of the animals in the movie and their behaviors, but we also tried to add some cartooniness and fun into the characters as well. MARK HENN: There was also a research trip to Africa that some of the team went on. They did tons of research into the animals, the locations and the weather – and they brought hundreds of photos back with them for everyone to study. Did you get to work with the voice artists from The Lion King? TONY BANCROFT: Yes, we did. In fact, we were at a lot of the recordings. MARK HENN: And if we weren’t there in person, they would record the sessions so that we could see the actors acting and saying their lines. TONY BANCROFT: It’s very influential when you’re animating. MARK HENN: It’s interesting because voice work has almost become a lost art for actors. In Walt Disney’s day, you had a whole generation of actors that did nothing but act on the radio with just their voice and a microphone. Nowadays, sometimes it’s difficult to separate the voice from the face. Did the actors get into character in the recording booth? MARK HENN: Everybody that we worked with really threw themselves into the characters one hundred percent. They worked really hard in the sound booth and they did a great job. It was really exciting to see them at work. How much of yourself do you see in your character’s animation? MARK HENN: Well, we’re all actors and I think you put a little of yourself in all of the characters you work on. In the past, I’ve worked on many of the leading ladies from Disney movies, including Belle, Jasmine and Mulan, and Tony is always telling me he can tell when I’ve animated a scene. How difficult was it to change from drawing a leading lady to animating a young lion? MARK HENN: It was a nice change of pace for me because I had animated several of our leading ladies back-to-back. I was starting to think to myself, ‘How am I going to make the next leading lady different to the previous?’ But then I was given the opportunity to do something different in The Lion King – and it was great. At the very start of production, I went to [The Lion King producer] Don Hahn and I asked to do the villain because I thought that would be a great change of pace for me. I was really interested in Scar and I had lots of ideas in my head for the character. At that stage, I was thinking about a really big, powerful lion for Scar – but Don Hahn came back to me and, in his very wise and charming way, said, “Well, we know you could do a good villain and we have no doubt of that, but Simba is the key to this whole movie. If Simba doesn’t work, the movie doesn’t work.” So that’s how they got me to work on Simba. It’s hard to say no to that. How did you approach your scenes in the movie? TONY BANCROFT: We work in a very similar way to how a director works with an actor in a live action movie. We are each issued a scene by the director. We’ll look at the story sketches that have already been created to help plan out the dynamics of the sequence and the director will say to us, “Okay, well, I like this element but I think this could be pushed a little.” We take in the director’s feedback and then we go back to our desk to do a bunch of small drawings – little thumbnails. We come up with our own ideas and then we go back to the director with the thumbnails to ask for feedback. If the director likes what he sees, then you can actually go ahead and start creating your animation. It can take an animator a week or so to create just three seconds of completed animation so it’s incredibly laborious, but it’s extremely rewarding. There’s a very poignant death in The Lion King were Mufasa is killed by a herd of stampeding wildebeest. How did you approach the animation of that sensitive scene in particular, Mark? MARK HENN: That was definitely a sequence that I wanted to be involved with and I spent a lot of time thumbnailing and planning sketches of what the sequence would look like. One of the key actions for Simba in this scene goes back to an earlier dream sequence where Mufasa explains to Simba about the stars in the night sky. They start wrestling each other, and at one point Simba grabs Mufasa’s ear. The ear pulling goes back further in the story, too. When Simba wakes up his father at the start of the movie, he cries, “Dad, wake up. Wake up!” And Simba pulls on his father’s ear. He bites it. He yanks on it. So when I started to looked at the animation of the death sequence, that became a key element to Simba’s actions. Simba has never experienced anything like this before. He thinks his dad is asleep. His sense tells him that something is more serious, but he approaches his father by tugging on the ear. Only this time his dad doesn’t wake up. How important was this scene in the movie? MARK HENN: I think it’s a really important scene and I’m proud that we didn’t shy away from it because it’s true to life and it shows something that we’re all going to experience. It was a tough scene to tackle, but I think we did it the right way. Walt Disney believed that you have to show powerful emotions like this, and you have to experience the bitter with the sweet. This is Simba’s lowest spot in the story and in order to make Simba the hero at the end of the movie, you have to take him to the rock bottom. What is the secret to the continued success of The Lion King? 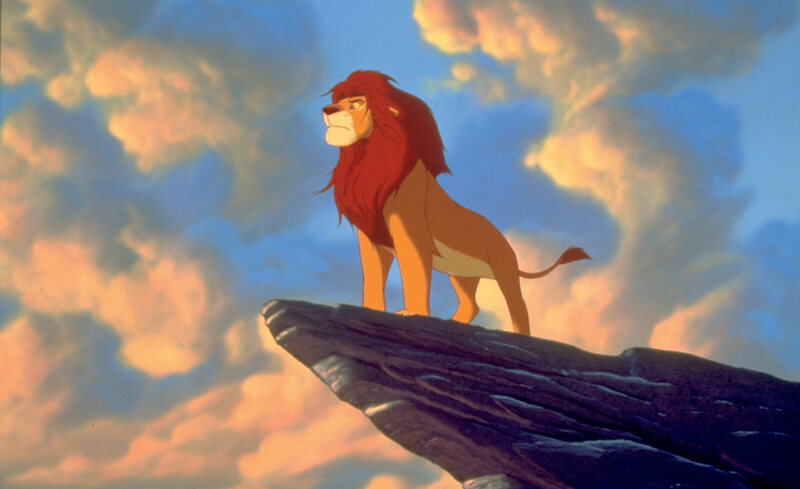 Tony BANCROFT: The themes, the story and the characters of The Lion King are timeless. The story is about a boy who grows up and learns about responsibility. Those things are part of everyone’s life, whether you are male or female, whether you are young or old. We all have to deal with the issues Simba deals with in the movie: the loss of a parent, how to deal with friends, and how to deal with stress. Mark HENN: Another reason the movie is still popular is because the music is very strong. It’s one of our strongest musical scores – and it’s timeless, great music. Why do you still tap your toe to something that was written in the ‘50s or ‘60s? Why do the Beatles still hold up? Because it’s all great music – and that’s exactly what we have in The Lion King. TONY BANCROFT: Plus, the movie is funny. Pumbaa and Timon are hilarious characters and the jokes are great. They were funny in 1994 and they are still funny today. What went through your mind when you were told The Lion King was going to be remade in 3D? Tony BANCROFT: When they first told us they were going to do the film in 3D, I thought to myself, ‘Wow, I wonder what it’s going to look like?’ And then I thought, ‘How on Earth are they going to do it?’ But having seen it in 3D, I can honestly say that I thought it was awesome and that it brings a whole new level of life, scope and depth to the film. I think it’s a more effective film because of the 3D. Would you agree that Pumbaa’s nose looks a little 3D, even in the original 2D version of the film? TONY BANCROFT: That’s definitely something I tried to do with Pumbaa. To try and get that dimension was one of the difficult things for me to do as an artist and as draftsman. Pumbaa has a big, pig-like snout and I wanted to capture that in certain scenes when the camera is right in his face, which is often when he’s talking to Timon. When I saw the film in 3D for the first time, I was blown away by those scenes and by what we were trying to achieve with our limited 2D drawings. It helps so much to see it in 3D because they are able to get across what we were trying to create in terms of volume and depth. They picked up on it and amplified it even more, so now the nose moves when he moves and it’s got that added dimension. As a creator of the original film, I couldn’t have asked for more. I think they’ve been very true to the original work and the original vision. It’s great. Mark HENN: We are both incredibly proud – and it feels great to be releasing this 3D version so that a whole new generation of people who maybe haven’t seen the movie before will now be able to enjoy it. It’s amazing that they will be able to enjoy it in ways that we never imagined possible back in 1994 when The Lion King was first released. It’s amazing how this movie has stood the test of time. Special LION KING Activities, Recipes and 3D Blu-Ray Coupon Offer!